Romano Gym will undergo upgrades to the playing surface, seating, and locker rooms as part of the $10 million renovation. Courtesy of UMD Athletics. The University of Minnesota Duluth athletic program announced a $10 million renovation project for Romano Gymnasium, home of the UMD volleyball and men’s and women’s basketball programs. The project, Romano 2020, is expected to be completed sometime in 2020 and will be the biggest upgrade in the history of the 64-year-old facility. UMD Athletic Director Josh Berlo said that the renovation project will not only benefit UMD athletics, but the campus as a whole. 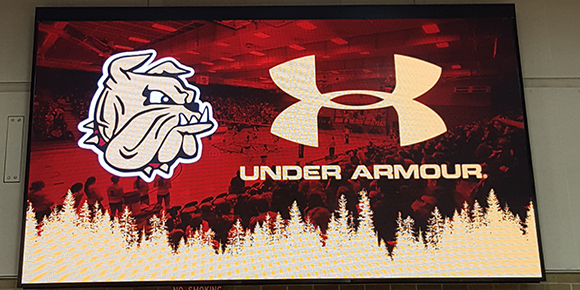 UMD installed a $300,000 video board in Romano Gym in 2017. Courtesy of UMD Athletics. Romano Gymnasium first opened on Dec. 12, 1953, with the UMD men’s basketball team earning a 73-72 victory over Gustavus Adolphus College. The Bulldogs volleyball program has won an impressive 86.2 percent of its home matches since 1977, while the men’s and women’s basketball programs have won 75 percent of their home games at Romano Gymnasium. Romano Gym will feature more Bulldog pride by showcasing the school colors and logo. Courtesy of UMD Athletics. The facility underwent a $2 million upgrade following the 1986-87 season and was not renovated again until UMD added a new scorer’s table display in 2013 and a $300,000 videoboard in 2017. The project is currently in Phase One, which includes the new video board and renovations to the men’s and women’s basketball locker rooms. Berlo said that the new additions to the facility will not only enhance sporting events, but also the Chancellor’s welcome to the freshman class, intramural sports and club events. Phase Two of Romano 2020 is expected to begin in the spring or summer of 2018 and will be completed by October 2018. These upgrades will include NCAA competition grade wood flooring, lower seating with back support, aisle mounted hand rails, a climate control system and additional Bulldog theming. Phase Three of the renovation will include club seating. Courtesy of UMD Athletics. While a timeline has not been set for Phase Three yet, the final part of the renovation project will add a club and hospitality room, upgrades to the lobby and atrium, renovations to the locker rooms for several UMD athletic programs and upgrades to UMD training, rehab and strength and conditioning facilities. According to Berlo, UMD has raised $1 million and is working to raise an additional $2 million in order to complete all of the desired upgrades. Approximately $7 million came from the University of Minnesota system’s HEAPR (Higher Education Asset Preservation and Replacement) funding and institutional facility funds. As a part of HEAPR, legislatures allocate funds to the University of Minnesota system so they can maintain and upgrade existing buildings. This portion of the budget will be used to address infrastructure issues with the addition of an upgraded playing surface, roof and climate control system. Student athletes will have access to upgraded locker rooms following the completion of the renovations. Courtesy of UMD Athletics. Berlo said that the project will showcase UMD’s logo and school colors, and the video board allows the university to showcase arts, music, sciences and other academic and recreational activities that happen at UMD.